While strolling along the beach, many of us come across stunning shells of all shapes and sizes. Who knew there could be such a diversity of sea snails? 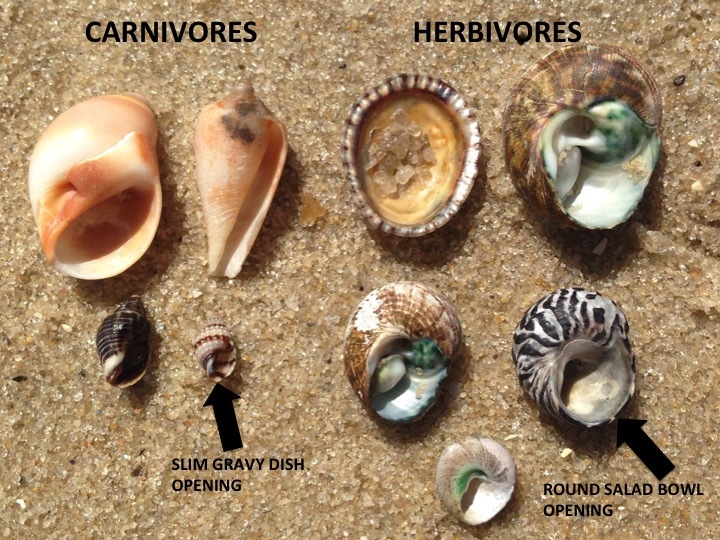 One little identification tip we like to hand out at Dalton Koss HQ is being able to tell the difference between a herbivorous (plant eater) and carnivorous (meat eater) marine snail. So, how can you tell the difference? If you have a look at the image displayed above and within the body of this text, the carnivores are on the left side of the picture and the herbivores on the right. The herbivores (right) have round or oval openings, shaped like salad bowls. The carnivores (left) have slim openings, shaped like gravy servers. This identification rule generally holds true, but as nature has it, there will always be those individual marine snails who go against the tide.